If you missed the almost ten hour long stream of Overwatch's beloved game developer, Jeff Kaplan, then don't worry -- you won't have to sit through watching all of it. These are the six best moments from the holiday stream. The fire behind Jeff Kaplan died down at one point during the stream. Instead of getting up to light it himself the common way, Jeff simply clapped his hands twice. The crackling fire returned immediately on command, reminding us that we are mere mortals in the presence of a God. 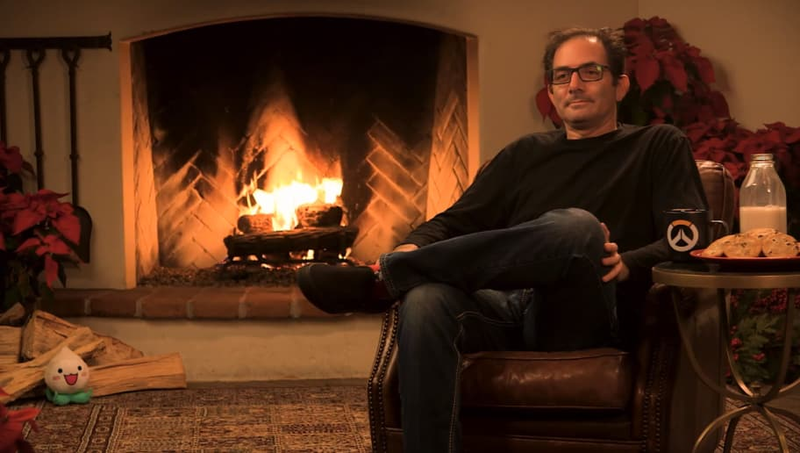 In the spirit of Christmas, Jeff Kaplan enjoyed some cookies near the fireplace at one point. To viewers, the cookies looked like they tasted good but Jeff said they were missing something. "I like my cookies like I like my Overwatch," he said. "With plenty of salt." Jeff Kaplan's stream was interrupted by a call from a telemarketer. You can hear the muffled voice of the caller as they begin to pitch a sale to Jeff. He handles the situation like a pro and thanks the caller but says that he'll have to call back later. What a nice guy! It wouldn't be Christmas without opening a present! Jeff opened a gift on screen, wrapped in beautiful wrapping paper. When he finally uncovered the gift, he nodded his head in fondness and agreement. The present? A portrait of Genji with the words "I need healing" written on it. The majority of the stream was just Jeff sitting and staring off into the void. The boom operator might have fallen asleep at one point as the off-screen microphone fell into Jeff's face. It knocked his glasses off, but Jeff held back a laugh and raised his hands as if asking "why?" This may be the cruelest joke Jeff Kaplan has played on fans so far, but we'll let it slide for the holidays. Jeff Kaplan teased us with who the next hero will be, only for the stream to glitch out on purpose. Could this be a joke or was that a real hint at who we'll be seeing in Overwatch next?